In response to the criticism facing the Johnson and Burgee design for Times Square Center, Park Tower Realty commissioned the firm of Venturi, Rauch & Scott Brown (VRSB) to design an alternative scheme for the Times Tower site, in the hope that Venturi's involvement might placate the critics. The pairing was odd in theory and practice. Robert Venturi and Philip Johnson were, in separate ways, the two American architects most responsible for the intellectual foundations and voguish spread of Postmodernism. Venturi's 1966 book Complexity and Contradiction in Architecture�was a seminal work that questioned the orthodoxies of less is more Modernism, such as Johnson had championed in the 1960s. Even more to the point of Times Square, his 1972�Learning from Las Vegas, the product of a Yale School of Architecture studio, written with his partner and wife Denise Scott Brown and other partner Steven Izenour, celebrated the idea of buildings as signs. 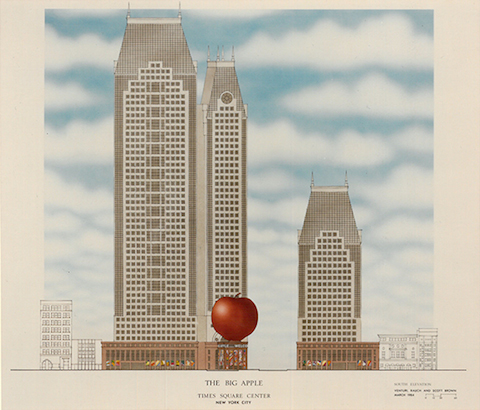 Johnson reinvented himself as a Postmodernist in the late 1970s, and in definitive projects such as the headquarters for AT&T with its ornamental "Chippendale top," he applied a wide range of historical styles to skyscraper commissions. "The Big Apple" in Times Square, South Elevation. Courtesy of Fred Schwartz. VRSB called their project "The Big Apple" and asserted that it provided "an appropriate counterpoint to the bulk and angularity of the surrounding buildings." The design not only complemented the architecture of the proposed office complex but also drew on the nostalgic character of the square. Paul Goldberger wrote in The New York Times that, "the genius of ["The Big Apple"] lies in its ability to manipulate proportion and the element of surprise in such a way as to make us think of the apple as a monumental object, not as a common piece of fruit." VSRB saw their design's "Contrasts and ambiguities in scale along with unusual juxtapositions [as] traditional means of creating surprise, tension and richness in urban architecture." The sculpture, sitting atop a classical base, would have added whimsy to the square in contrast to the skyscrapers and would provide a focal point for the intersection. VRSB went through multiple iterations of their design before deciding on the version seen here. 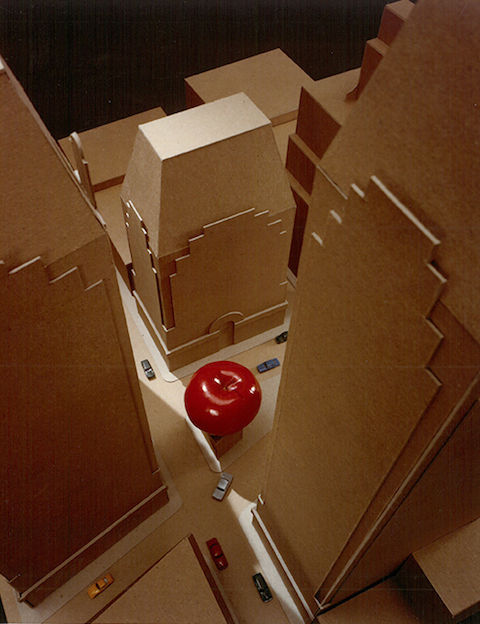 The rendering shows the sculpture among the Johnson and Burgee towers from a street perspective (seen in the installation view above). For this depiction, Frederic Schwartz drew the office buildings himself, presenting a slightly different view than the standard angles shown by Johnson and Burgee. The photos on this wall depict the Big Apple as it would appear as an element of the greater design. The base of the sculpture blends seamlessly with the bases of the four office towers, in one instance the base continues the colorful display begun by the neighboring buildings. In addition to the photos seen here, VSRB completed renderings of the project at night to show how the sculpture would enhance the atmosphere of the square. 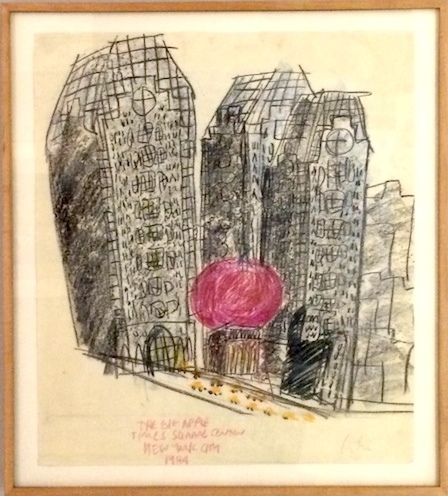 Big Apple in Times Square Center drawing by Frederic Schwartz, 1984. This playful drawing hanging was a personal sketch by Frederic Schwartz, who called it the EAR INN drawing after the local lower Manhattan bar where it was made.